Daughter of Dubtach, pagan Scottish king of Leinster, and Brocca, a Christian Pictish slave who had been baptized by Saint Patrick. Just before Brigid's birth, her mother was sold to a Druid landowner. Brigid remained with her mother till she was old enough to serve her legal owner Dubtach, her father. She grew up marked by her high spirits and tender heart, and as a child, she heard Saint Patrick preach, which she never forgot. She could not bear to see anyone hungry or cold, and to help them, often gave away things that were Dubtach's. When Dubtach protested, she replied that "Christ dwelt in every creature". Dubtach tried to sell her to the King of Leinster, and while they bargained, she gave a treasured sword of her father's to a leper. Dubtach was about to strike her when Brigid explained she had given the sword to God through the leper, because of its great value. The King, a Christian, forbade Dubtach to strike her, saying "Her merit before God is greater than ours". Dubtach solved this domestic problem by giving Brigid her freedom. Brigid returned to her father, who arranged a marriage for her with a young bard. Bride refused, and to keep her virginity, went to her Bishop, Saint Mel of Ardagh, and took her first vows. Legend says that she prayed that her beauty be taken from her so no one would seek her hand in marriage; her prayer was granted, and she regained her beauty only after making her vows. Another tale says that when Saint Patrick heard her final vows, he mistakenly used the form for ordaining priests. When told of it he replied, "So be it, my son, she is destined for great things." Raised in a Christian family, his father died when the boy was very young, he was raised by his mother Eukaria, and he worked as a goose-herd in his youth. Had a gift of healing both human and animals. Healed the demonic possession of the daughter of Emperor Gordian III; the demon appeared in the form of a black dog before being forced to admit his deeds and then vanishing. Tryphon's prayers turned away a swarm of locusts that threatened his village's grain harvest. A persuasive speaker and catechist, he brought many to the faith, including pagan imperial officials. Arrested, tortured and martyred in the persecutions of Decius. Priest. Professor of canon law at the Sorbonne in Paris, France. Dean of the collegiate church of Saint-Agnan in Orléans, France. While on pilgrimage in Rome, Italy in 1218, the future Pope Gregory IX introduced him to Saint Dominic de Guzman. Reginald was moved by Dominic‘s preaching, fascinated by some of his ideas, and the two became close friends. 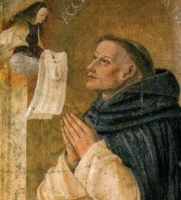 Following a vision of the Blessed Virgin Mary presenting him in a Dominican habit, and his miraculous cure from the vision, Reginald joined the Dominicans, receiving the habit from Saint Dominic. The two travelled to Bologna, Italy where Reginald impressed many with his preaching, and served as Dominican prior in the area when Dominic travelled on. Prior of the Dominican convent of Saint-Jacques in Paris in 1219 where he was known for his preaching, and where he led many to join the Order. Friend of Blessed Jordan of Saxony, who wrote about him and the fire of his preaching. Married layman in the diocese of Tzaneen, South Africa. Member of the Lemba tribe, called "Black Jews" because they followed Jewish laws and traditions. Converted to Catholicism in 1963 and became very active in the Church. Teacher, catechist and worked with local youth; he combined all these works by checking on students who missed class, and helping their families when money ran low. Helped build the first Catholic church in his area. Principal of his school, popular local leader, and advisor to area civil authorities. When his village was beset by a series of strong storms in late January 1990, the elders decided it was due to magic, and demanded a tax from all the residents to pay for magic to counter them; Benedict said storms were a natural phenomenon, and he wasn't paying anything to support anti-Christian superstition. Murdered by a mob for refusing to support the witchcraft plan. Born a prince the eldest son of King Dagobert I. Brother of King Clovis II. Baptized by Saint Amand of Maastricht at Orléans, France. Educated by Blessed Pepin of Landen. His father died in 638 which made the boy king of Austrasia. In 640 he tried to add Thuringia to his kingdom, leading his own army at the age of ten, but was defeated by Duke Radulph. Following this and some other political bungles, the mayor of the palace, Grimoald, began to assume more power, and eventually became the true ruler of Austrasia; Sigebert became known as a "do nothing" king who withdrew from the political scene. Spiritual student of Saint Cunibert of Cologne. Father of Saint Dagobert II. Sigebert became known for his personal sanctity, his pious life in the royal court, and his works of charity; he built several hospitals, churches, homes for the poor, and monasteries, including Stavelot and Malmédy. Evangelized the area of Digne, France. Fought Arianism. Archdeacon under Bishop Jucundus of Aosta, Italy. When the Arian Ploziano became bishop of Aosta, Ursus and several other canons relocated to the church of Saint Peter just outside Aosta; the site is now known as Sant' Orso, the church is the collegiate church of Saint Peter and Saint Ursus. Anna's father died when she was very young, and though she grew up in poverty, her family always had time to care for those worse off than themselves. She studied with the Sisters of Saint Charles in Lyon, France. 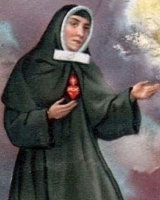 Following the death of her mother and brother, Anna entered the novitiate of the Sisters in Lyon in 1863, taking the name Sister Giovanna Francesca of the Visitation. The Congregation was dissolved in 1871, and Sister Giovanna lived for a while with her father‘s family. In 1874 she founded the Little Servants of the Sacred Heart of Jesus to care for the sick poor; the Servants continue their good work today. Convert. Studied for the priesthood in Rome, Italy. Joined the Jesuits in 1626. Worked as a covert priest in London, England. Worked with plague victims in 1636, catching the plague himself - and recovering from it. Betrayed to the authorities by an informer, he was briefly imprisoned in 1638. He ministered to people around the countryside of southern England for years. Arrested and convicted of the crime of Catholicism in 1647. One of the Forty Martyrs of England and Wales. Benedictine Cistercian monk at Clairvaux Abbey, professing his vows under Saint Bernard. Abbot at Guingamp, France. Founder and abbot of monasteries at Buzay and Bégard in Brittany (in modern France). Noted as an able administrator, always fair and just with his brother monks. Bishop of Aleth (modern Saint-Servan, France) from 1144, a see that was later moved to Saint-Malo. Introduced the Canons Regular to his diocese c.1150. The de Craticula (of the Grating) part of his name derives from the metal railings that surround his shrine. 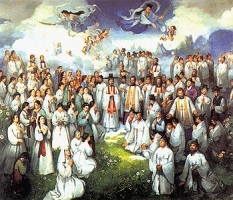 Member of an impoverished but noble family, she was drawn to religious life from an early age. Pilgrim to Santiago de Compostela, Spain. Anchoress at age 26, living 34 years in a tiny cell at the chapel of Saint Anthony of Padua, Florence, Italy. Received the habit of the Secular Franciscan Order from Saint Francis himself in 1211. Legend says that when a famine struck in the area of her home town, she gave away some beans her uncle had already sold; the next day, after the poor had taken their fill, the storage bins were mysteriously refilled. Priest. Canon of the cathedral of Tarazona, Spain. Cistercian monk at the Escaladieu Abbey in Gascony, France. Founded the abbey of Fitero in Spanish Navarre, and served as its first abbot. Founded the Benedictine and Cistercian military Order of Calatrava to defend Calatrava la Vieja, Spain from invading Moors after the city was abandoned by the Knights Templar. Born to a poor peasant family. Worked as a shepherd in his youth. Priest. Monk. Abbot. Bishop of Avranches, France. In his later years, he resigned his see and returned to monastic life. Franciscan Friars Minor (Observants) priest. Chosen bishop of the diocese of Down and Connor, Ireland on 13 May 1582 by Pope Gregory XIII. Arrested in 1588 in the anti-Catholic panic following the failed invasion by the Spanish Armada. Arrested again in 1611, he is one of the Irish Martyrs. During the persecutions of Decius, Asclepiades and fifteen fellow parishioners, hearing they were about to be arrested, spent the night of 22-23 February 250 in prayer; they were arrested in the morning at the end of Mass. They had put on their own chains and shackles to make it obvious that they were prisoners, and not going to aposticize. Asclepiades was racked and torn with hooks to make him sacrifice to pagan gods; he refused. Martyr. During the persecutions of Decius, Sabinus and fifteen fellow parishioners, hearing they were about to be arrested, spent the night of 22-23 February 250 in prayer; they were arrested in the morning at the end of Mass. They had put on their own chains and shackles to make it obvious that they were prisoners, and not going to aposticize. Racked and torn with hooks to make him sacrifice to pagan gods; he refused. Martyr. Princess of Ulster, Ireland. Converted to Christianity by Saint Patrick; when she became a nun, Saint Patrick gave her the veil. Greatly honoured in County Louth, Ireland. Paul fled his home to escape the Germanic tribes invading the northern provinces of the Roman empire. He became a hermit near Arles, France. Reluctant bishop of the former diocese of Augusta Tricastinorum (modern Saint-Paul-Trois-Châteaux), Dauphine (in modern France). 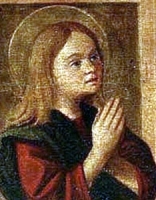 Sister of Saint Andrew of Fiesole. Hermitess in the Apennines mountains of Italy. Legend says that when her brother was dying, angels carried her to his deathbed for a final visit. First bishop of Granada, Spain. One tradition says that he was a disciple of Saint James the Greater, and was consecrated as bishop by Saint Peter the Apostle. Bishop of Ravenna, Italy in 283. Attended the Council of Sardica in 344. Spiritual student of Saint Brigid at her convent in Kildare, Ireland. 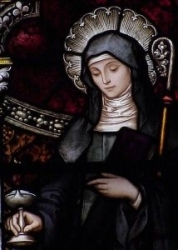 She succeeded Saint Brigid as abbess of the house. Seventh century bishop of Le Puy-en-Velay, France. Pilgrim to Rome, Italy. On his way home he was murdered by idol worshippers. Spiritual student of Saint Patrick. Bishop of Armagh, Ireland. Involved in the monastic expansion and general missionary work in the British Isles. Benedictine monk at Landevennec, Brittany, France. Chaplain to the nuns of Saint Sulpice, Rheims, France. Assisted with Saint Breaca's missionary work in Cornwall, England. The town of Crowan was named for him. Ascetic hermit in Seligenstadt, Germany. Forty-seven Christians executed together for their faith in the anti-Catholic persecution of the French Revolution.